KUFPEC ...... signed an exploration license and petroleum concession agreement. Kuwait Foreign Petroleum Exploration Company (KUFPEC) has signed an exploration license and petroleum concession agreement with Pakistan, for the Paharpur Block in the country. The deal was inked by Sheikh Nawaf Saud Al-Nasser Al-Sabah, CEO of KUFPEC and Arshad Mirza, Pakistan's secretary for petroleum and natural resources in Islamabad, according to Kuwait News Agency report. The company CEO Sheikh Nawaf said the Paharpur Block, located in the D I Khan District spread over an area of approximately 2,261 sq km. 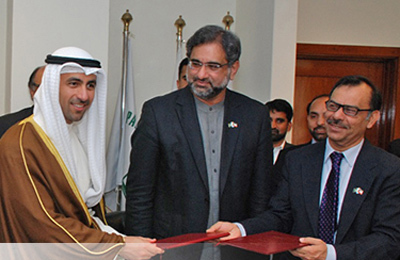 The Kuwaiti partners in the Paharpur Block are State Oil and Gas Company of Khyber Pakhtunkhwa, he added. KUFPEC currently operates the Jati Exploration Block in Sindh, where drilling activities are expected to commence soon. The firm also has producing interests in Qadirpur, Zamzama, Kadanwari, Bhit, Badhra, Sukhpur and Zarghun Blocks, and is the third largest gas producer amongst foreign exploration and production companies operating in Pakistan. KUFPEC has invested more than $1 billion in Pakistan since 1987 in "our efforts to make Pakistan a core business center for KUFPEC," Sheikh Nawaf said. KUFPEC, a subsidiary of Kuwait Petroleum Corporation, is an international oil company engaged in the exploration, development and production of crude oil and natural gas outside Kuwait. It is currently active in 15 countries worldwide with 63 oil and gas projects across Asia, Africa, Australia, Europe and North America.